Great and intriguing sounds emanating from the building today as rehearsals crank up for different musical experiments from Birmingham Conservatoire. The whole week has a varied program of events. The best way to work out what is happening is visit the event’s website. We are pleased to announce two stand-out events visiting @ A E Harris in a single week. On 22nd April we are flattered that Angela Clerkin and Improbable have chosen @ A E Harris as the Birmingham stop off for national tour of The Bear. The show looks like a lot of fun and we’d be really pleased if there were a good crowd to welcome this prestigious company to our venue. Then, with a day to recover, we welcome long time Stan’s Cafe collaborator Bernadette Russell to the venue with her own company White Rabbit and her own show 366 Days of Kindness. This is a work-in-progress preview of the piece, which has close connections with Birmingham as it was born out of the riots two years ago. For Angela’s show you need to buy tickets from here. For Bernadette’s you have to be invited, but that’s easily done if you follow the links. Theatre Fever started in the West Midlands district today. Double Plus Good. 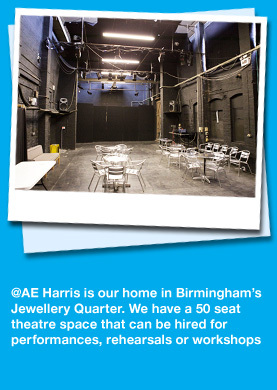 Four productions @ A E Harris over these two weeks which contribute to this celebration of West Midlands Theatre. Tonight Inferno Kid, next week 1984, then Palimpsest City and finally The Furies. Surely that’s enough of a range for there to be something you fancy. Come and catch the Fever. Not only is The Inferno Kid back but he now has his own trailer. The Inferno Kid was once professional wrestling’s brightest star – a risk-taking daredevil both inside the ring and out. Today he is disabled, destitute and all but forgotten by the wrestling world. He is only 36. Now the living room of his wife’s council flat provides a fitting venue for one final showdown – this time, with the demons of his past. But with his mind and his marriage on the line is this a match The Inferno Kid can win? We’re delighted to welcome Alex Brockie back to @ A E Harris on 9th March with this great show. We feel a special connection with it as a section was tried out in the venue as part of a Pilot Night a couple of years ago. We are delighted to welcome long time friend of @ A E Harris Pete Ashton to the venue with his colleague Matt Murtagh to run a photography workshop focusing on long exposure techniques on 19th March 7pm – 9pm. Proof there is always something new and interesting happening @ A E Harris. It is an exciting collaboration which promises some quality performances. Tickets are £7.50 or £5.00 at the concession rate. The bar will be open serving both HOT and cold drinks. On Thursday we host Decibel, who are joined by saxophonist Paul Dunmall to perform Ed Bennett’s Dzama Stories. It’s our second jazzy evening, coming approximately a year on from The Necks and Harold Budd’s appearance at the venue. This time there is a ten piece band on stage and there is a mixture of pre-composed and improvised music. Very reasonably priced ickets are available here. The appearance of a coffin and Barber’s chair in the venue can mean only one thing: Sweeney Todd is coming to town. 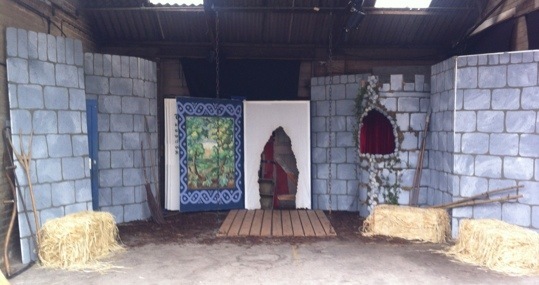 Atomicus productions have a live band in and tickets cost just £12 for adults and half price for children . Open for business tomorrow until Saturday.